Launceston boss Mike Lewis says his players need to improve their mental attitude after losing 38-12 to Taunton. 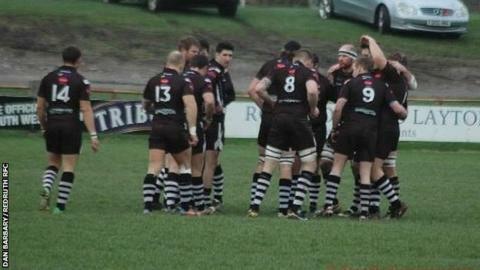 The Cornish All Blacks are still bottom of National Two South after their third defeat in three games. "I don't know if it's the mental attitude of our players or if our approach is wrong, but we've got to get to the bottom of it," Lewis said. "It's taken them 40 minutes of rugby to try and get into the game and when we did get into it we looked dangerous." Tries from former Launceston players Aaron Struminski, Barrie-John Chapman and Gary Kingdom saw Lewis' side 26-0 down at half time, but they rallied to draw the second period 12-12 thanks in part to tries from Jon Dawe and Eddie McGinley. "It takes us that 40 minutes to recognise that we are good players and we have got the confidence to do this," Lewis told BBC Radio Cornwall. "We've got to get it into their heads and approach it with a strong mental attitude every week and a real positive one because we can show what we've done and we'll show it every week, but we're not starting well enough."